1906 Crafstman located in Country Club Park. 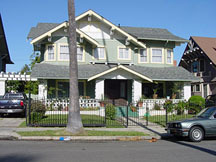 A 2 story, 3 bedroom, 2900 sq.ft. interior on a 9000 sq. ft. lot. 3 fireplaces, a sleeping porch, large kitchen, formal dining study very large backyard and more. Film, television, still photography, etc. 2900 sq. ft interior, 9000 sq. ft lot.